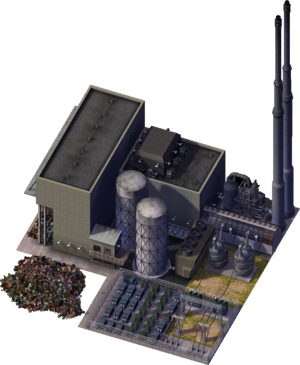 The Waste To Energy Plant is a utility building that burns Garbage to produce Power for your Sims. Waste to Energy plants are designed to be connected to zones and buildings with Power Lines, but do not have to be as they provide power to other buildings within a three-tile radius and those buildings may relay that power to other buildings in another three-tile radius and so on. The Waste to Energy plant is a special Power Plant as it also consumes Garbage. A bug in the game means that the funding for these plants can be lowered to the minimum, meaning that it will produce no power, minimal pollution and cost nothing, but still consume the maximum amount of garbage as if it was fully funded. It is positioned between the Natural Gas Power Plant and Coal Power Plant in power production and produces the same amount of power as the Solar Power Plant, however it produces much more pollution than all three. This page was last modified on 2 December 2018, at 02:26.